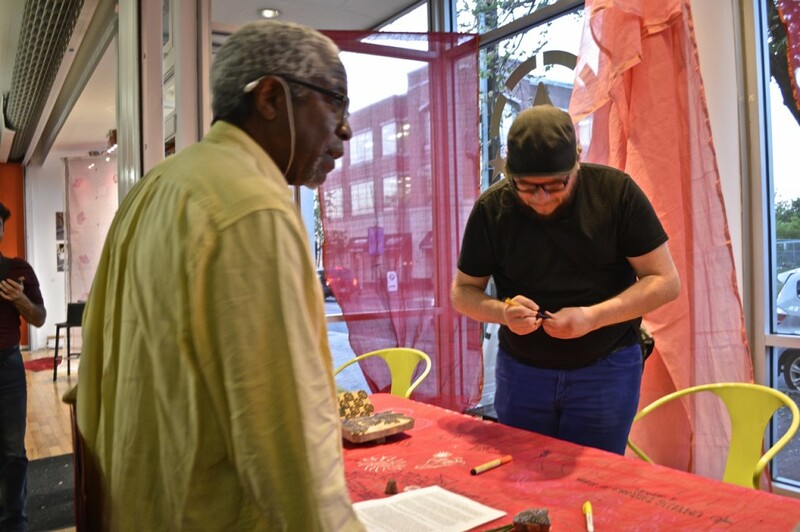 After a year of planning and several weeks of intense work, it was very exciting to finally open the exhibition and workshops “Climate and Actions” at Anacostia Arts Center. The AAC is such a beautiful space and opens directly onto the street so that people can see what is happening inside and walk right in. I spent the whole past week working with AAC staff to create the installation. What a pleasure to work with Kate, Camille and Amy! 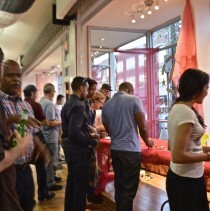 All kinds of people have been coming into the space and asking questions about the exhibition. 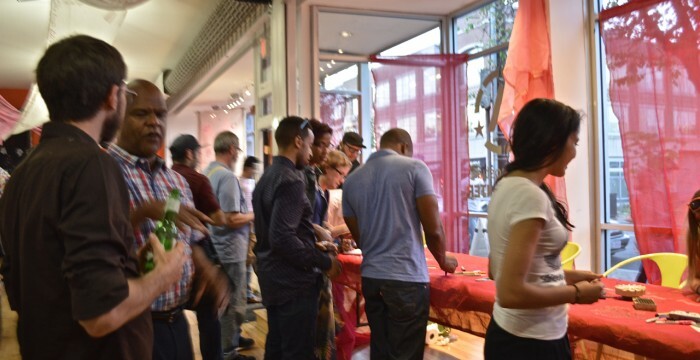 My daughter Tuli helped me with the Sari Pledge Workshops, which was set up in the front window of the gallery. We had tremendous interest from the visitors, who were full of ideas for how to reduce their carbon footprint. I also had a small solar demonstration in the workshop window — using a single panel to charge up my iPad and phone as well as small lights. This technology is on loan to me from Green Brilliance, the company I hired to install my own solar panels last year. I am happy to report that half my energy is coming from solar energy and my electric bill is 50% lower. It was also great to talk with photographer Greg Kahn, whose show opened the same night in the adjacent gallery Vivid Solutions. Greg’s show is also dealing with climate change — but around the corder in Maryland’s Eastern shore. Like coastal areas in Bangladesh, these parts of Maryland are adversely affected by sea level rise and their entire way of life and ancestral homes are being destroyed. Like the people of Katakhali, these Marylanders also survive by fishing and have little political clout. Tuli and I spoke one on one with visitors, explaining the Storytelling with Saris project and sharing stories about how climate change is affecting Bangladesh and coastal areas around the world. Dozens of people took the time to think, engage, and make a pledge. We finished one sari by the end of the night and hung it up in the gallery window. More saris will be added to the gallery as the workshops continue. The saris will be used for a performance in DC in September. All of you who pledged will be invited to join. The saris will ultimately be returned to Katakhali to be worn by coastal women. Many thanks to everyone that came to the opening — both the folks in the neighborhood and those who came clear across town in the middle of Friday rush hour. 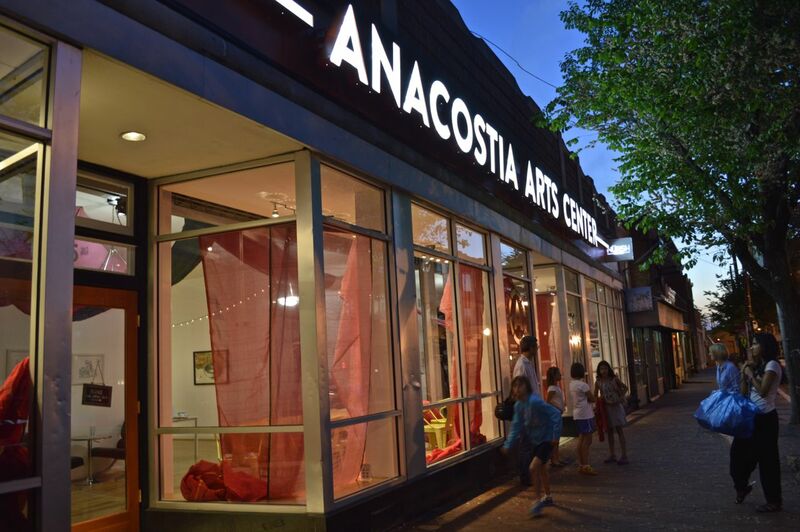 Special thanks to everyone at Anacostia Arts Center and to DCCAH for supporting this project. More workshops: Thursday May 14 and May 21 from 11 am to 1 pm; Saturday May 23, May 30 and June 6 from 11 am to 2 pm. Workshops free but sign up please on eventbrite. Wednesday – Saturday: 10 am – 8 pm and by event.